18+, T&Cs apply, New Customers Only. Min deposit £10. 35x bonus wagering requirement applies. Free Spins credited on Starburst in batches of 10/day over the next 4 working days and carry a 15x wagering requirement. Bonus expires 7 days after opt-in. Maria Bingo is an online bingo room at Maria Casino, run by Unibet (International) Ltd under a UK gambling license. The property was rebuilt as a part of the game section at Maria Casino’s new progressive website that was launched in 2016. Maria Bingo uses internet bingo software provided by Relax Gaming, a recognized online gambling provider. Maria Bingo offers seven different types of bingo games in their online bingo rooms at Maria Casino. 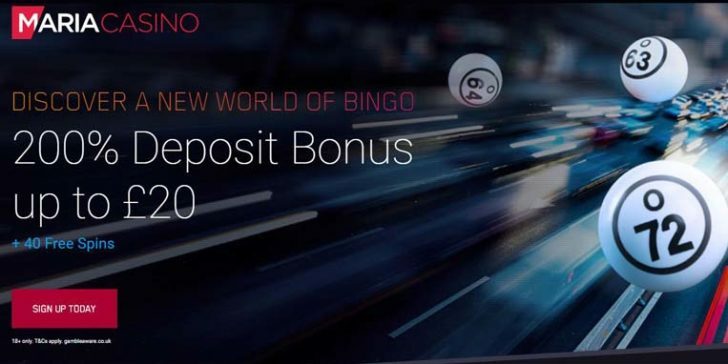 This is available at a fresh and fully responsive website that was designed to deliver the best possible gaming experience for players on all devices, including desktop and mobile bingo. The site also offers the possibility of customization. Players can set ‘Preferences’, ‘drag and drop’ titles to ‘My Games’. ‘Like’ and ‘Favourite’ features also serve for customizing gaming content at Maria Casino. Live chat is also available on the site to interact with other players, making every session at Maria Bingo a social bingo gaming experience. New players at Maria Casino can choose from three welcome packages.The first option is 200% up to £20 match bonus. The second welcome bonus option that you can opt in is 150% up to £60 while the third one is 100% up to £100. 10 free spins on Starburst in each of the first four days for new users also comes after registration, irrespective of the welcome package. Banking options are somewhat limited with Credit and debit cards (Visa, MasterCard, Maestro), PaysafeCard and Earthport are being available only for making a deposit or withdrawing bingo winnings. However, Maria Casino has an excellent 24/7 customer service through live chat, phone and email that is ready to sort out any problems players would refer to them. Overall, Maria Bingo is available at a top-quality website that runs smoothly on any device and is a highly recommended online bingo room both for beginners and experienced online bingo players. 100% up to £100 + 40 Bonus Spins Play! Join Maria Bingo and Win Money For Free! Play! Join Maria Bingo and Win Money For Free!